Between 35,000 and 12,000 years ago the last of the great glaciers of the Pleistocene advanced and retreated. Between 35,000 and 12,000 years ago, as the last of the great glaciers of the Pleistocene advanced and retreated over the grasslands of Europe and the New World, people like ourselves--Homo sapiens sapiens--began to flourish. Hunters and gatherers, they wore clothes made of animal skins, had shell and bone ornaments and used such tools as spears and knives. They made music and were prolific artist. This was a time of exceptional artistic achievement and technological advance, and it may have been during this period that the first wild animals were domesticated. 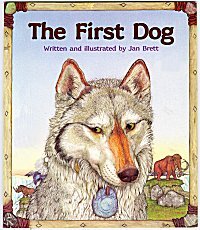 Jan Brett has created an appealing story from this possibility, setting it in a breathtaking Ice Age landscape populated with animals that coexisted with early man in Europe and the New World. The images and ornaments of her borders were inspired by the cave paintings and artifacts surviving from this time.